The before picture shows a uneven slabs in a pool deck, which is a trip hazard. The After picture shows this area being leveled with cement grinding. Uneven, sunken or sloping concrete slabs on patio/ front entrance. Also, efflorescence and erosion. Would like to assess the cause and get an estimate for repair / remediation (and possibly decorative surfacing). Also, would like to assess if there is any foundation damage due to water issues. Have about 13 feet of sidewalk tha has sunk at the front door of my house. Are you worried about the state of your home or business' foundation in Palm Desert? When soil conditions, rainfall, and other factors combine over time, you can find yourself with a sinking, cracked or damaged foundation. With 30+ years of foundation repair experience, Saber Foundation Repair has the tools you need for a safer, worry-free home. Customers contact us with all types of foundation repair concerns ranging from wall cracks to sagging floors, sticking doors and windows, soil erosion, and more. When it comes to foundation & concrete problems, we have the solutions! Foundation repair problems tend to develop slowly, but if you don't keep an eye on them and make repairs when necessary, you will find yourself spending a whole lot of money down the line. Bowing walls, sagging floors, sticking windows, cracks, and more will make life at home uncomfortable, stressful and potentially dangerous. Additionally, when it's time to sell your home, you'll either have to resolve all foundation problems or take a hit on your home's overall value. Saber Foundation Repair offers a variety of affordable, proven solutions for all of your foundation repair needs. Our foundation repair specialists can inspect your foundation, pinpoint all problem areas and come up with lasting & dependable solutions. In addition to our residential foundation repair services, we also provide support for commercial foundations. Not only can we offer reliable foundation repairs for existing structures, but we can also take on deep foundations for new commercial constructions. Using a variety of equipment built for commercial and government projects, such as helical piles and anchors, helix piers, tieback anchors, and more, you can trust Saber Foundation Repair for all of your commercial foundation design and restoration needs. Saber Foundation Repair offers complete crawl space repair and encapsulation services using CleanSpace, our patented vapor barrier system. By installing a crawl space vapor barrier and additional products like thermal insulation, dehumidifiers, or drainage matting if need be, you can create a fully enclosed, arid crawl space that won't allow any moisture to enter. If your crawl space has rotted or sagging support joists, we can also assist by installing our galvanized steel crawl space support jacks. Your crawl space bears the weight of the floors above, so having stable supports is crucial! Sunken, uneven concrete creates tripping hazards all around your property; it also makes a huge eyesore. Saber Foundation Repair uses PolyLevel to perform concrete leveling & lifting services with ease. PolyLevel is the premier concrete leveling product on the market today. PolyLevel is a lightweight polyurethane foaming agent that is injected into a small hole beneath your concrete. The foam reacts and expands into a strong yet lightweight support system perfect for concrete leveling & lifiting. For a fast-acting, long-lasting, and environmentally friendly concrete leveling solution, Saber Foundation Repair and PolyLevel are what you need! For all of your foundation repair, concrete leveling & crawl space encapsulation needs, Saber Foundation Repair can provide you with industry-leading solutions installed by technical experts. Contact us today to learn more and to schedule a free estimate in Palm Desert! Our services will resolve the root source of the problem and we are here to help should any questions arise. Homeowners and business owners in Palm Desert, CA know that earthquakes are all too possible in the area. That's why it's important to be prepared with the proper reinforcement for your home. Saber Foundation Repair's seismic retrofitting consists of professionally installed metal connectors, anchor bolts, and other reinforcement materials that stabilize your home's structure. By installing these reinforcements at certain key points, we can create a connected protection system that will keep your home stable, secure, and grounded when earthquakes strike. We also provide seawall repair and bulkhead repair for seaside properties and municipal purposes. If your seawall is cracking, tilting, or eroding, our helical seawall anchors will provide stabilization that will last through storms, tides, and the constant stress of water flow. 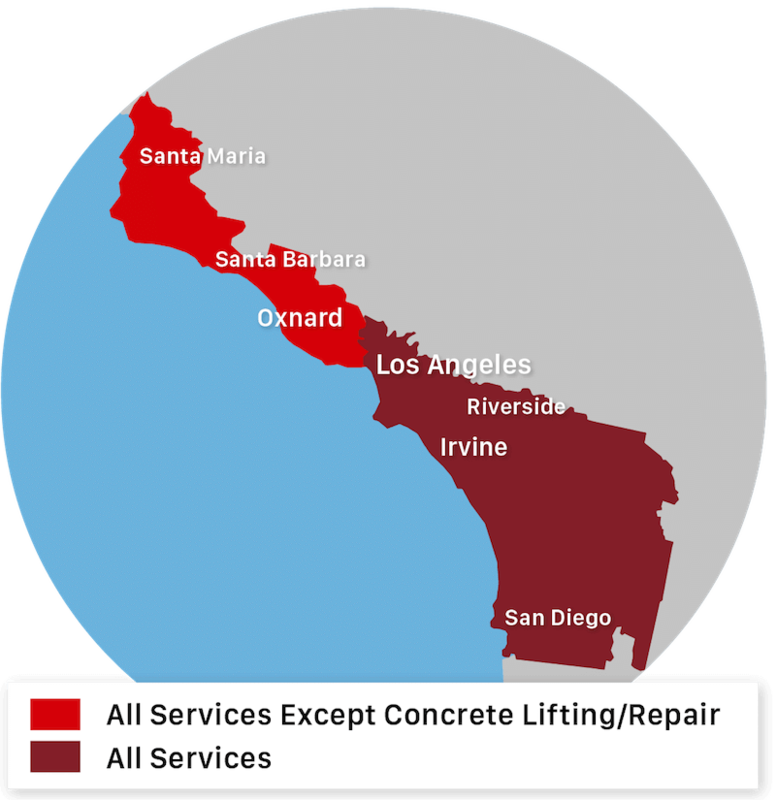 We also offer concrete repair services including concrete grinding, concrete stair repair, shotcrete, crack repair, and property evaluations. Whether you need foundation repair, crawl space encapsulation, concrete leveling, seismic retrofitting, or any other home improvement service, Saber Foundation Repair is the foundation contractor you can trust! Contact us today to get a free quote in Palm Desert, CA! The City of Palm Springs Aquatic Center contacted Saber about unlevel conrete, that was causing tripping problems. This picture shows the concrete after we ground and leveled it.